Right-wing Brazilian presidential candidate Jair Bolsonaro’s strong showing in the first round of elections earlier this month might see the “Tropical Trump” win the second one. The firebrand populist narrowly missed winning the first round outright after clinching a surprising 46% of the vote and is now on track to possibly trounce his leftist competitor Fernando Haddad during the second round on 28 October. Most people are already aware of Bolsonaro’s ultra-controversial comments on social issues so there’s no need to reiterate them in the interim period before the final vote, but what’s important to focus on during this time is how the US-backed Hybrid War on Brazil shaped the electoral environment in his favor. “Operation Car Wash”, the far-reaching anti-corruption inquisition that brought down former President Dilma Rousseff’s government and led to the imprisonment of former President Lula, was facilitated by the NSA and succeeded in exposing the deeply entrenched corruption of the governing leftist elites and some of the right-wing opposition. This increased the people’s apathy in their country’s political process more than anything else ever could have, and it also had the effect of making Bolsonaro – who at the time was a fringe politician that barely passed any legislation at all despite his decades in office – a national hero of sorts because he was proven to have been one of the country’s only uncorrupt lawmakers. This newfound attention allowed him to amplify his socio-economic messages of arming the populace and privatizing the economy to a national audience, which was remarkably receptive to what had previously been considered to be these extreme measures. That only goes to show, however, just how far the so-called “Overton window” has shifted in normalizing previously radical positions following the success of the US-backed Hybrid War on Brazil which specifically targeted the legitimacy of the ruling socialists at the time. The country has also been in the throes of an ever-worsening crime wave that the previous administrations hadn’t done much to stop, which is why Bolsonaro’s gun rights and anti-crime messages are so wildly popular among many just like Philippine President Duterte’s crackdown on drug gangs has earlier proven to be among his own countrymen. The situation for many in Brazil has devolved to the point where they’re mostly just interested in bread, shelter, and security, and while the socialists delivered on the first two of the people’s needs, it might ultimately be the last-mentioned one which explains Bolsonaro’s surging popularity even more than his uncorrupt reputation. Be that as it may, the pollsters were surprised by his showing last Sunday because it seems that many of his supporters didn’t feel comfortable openly backing him before the vote. Just like with Trump in 2016, they might have felt that others would denigrate them for being “racists”, “fascists”, or “white supremacists” and therefore felt it better to “self-censor” their views until they could privately express them en mass during the election. Having explained all of that, it would be disingenuous to attribute Bolsonaro’s rise solely to the US-backed Hybrid War on Brazil while overlooking the country’s preexisting polarization and the policy failings of the socialists. 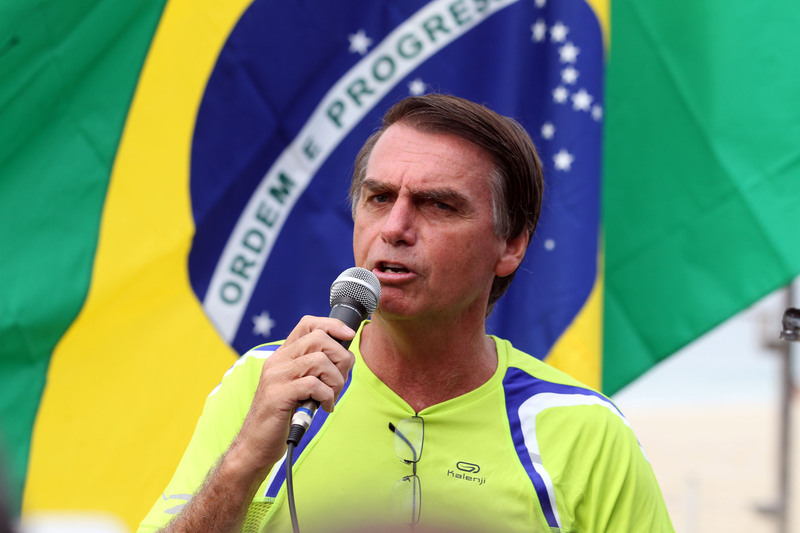 It’s more the result of a combination of the two, though the effect that the Hybrid War had on shaping the electoral environment beforehand in Bolsonaro’s favor more so than any other presidential candidate’s is important to dwell upon because it suggests that he may have been identified by the US far in advance as their preferred candidate for leading Brazil.